Artisanal American cuisine in Rittenhouse Square. 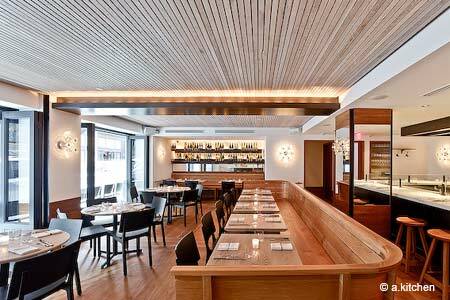 : This sleek restaurant is adjacent to the AKA Rittenhouse Square hotel. In a modern, crisp space that includes a marble chef's counter and a smattering of sidewalk seating, a.kitchen specializes in innovative small plates that strike a fine balance between style and substance. A homemade English muffin is the building block of a breakfast sandwich, and does justice to a bacon-cheddar burger at lunch. Dishes such as smoked beets with “almond cheese”; seared pompano with spring onion romesco; and lamb belly with blackberry barbecue sauce deliver a flavor punch with surprising savory flourishes. The menu changes seasonally, so that's just a taste of what you can expect. The mid-size Euro-centric wine list highlights boutique producers from regions such as the Loire, Alsace and Finger Lakes. There's also a craft beer selection and an array of cocktails. Desserts might include buckwheat pound cake with Asian pear curd or a semi-traditional bittersweet chocolate mousse with pumpkin seed, kumquat and licorice. Next door is a.bar, an intimate cocktail lounge featuring an extensive raw bar and an assortment of seafood-driven small plates, along with inventive spins on comfort fare such as burgers and fried chicken.